A more exacting standard for punctuality will be brought in on UK railways next month in an attempt to improve performance. From 1 April, train times will be recorded to the minute at every stop. This is against the current measure which deems a train to be "on time" if it reaches its final destination within five minutes of the timetable, or 10 minutes for a long distance. Rail punctuality across the UK sank to a 13-year low in 2018. Punctuality information will let passengers get a more accurate picture of exactly how good their service is. UK rail passengers have become increasingly frustrated by delays in recent years as creaking networks, staff shortages, and industrial action have taken their toll. In the year to the middle of October 2018, trains clocked up 32 years of delays. According to the Office of Rail and Road, total delay hours have increased 22% since 2008-9, compared with a 10% increase in the number of trains running. With rail fare increases digging ever deeper into consumers' wallets, passengers do not believe they are getting the service they are paying for. 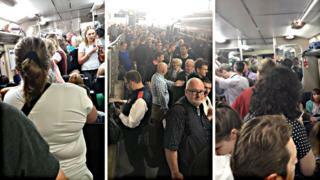 In September 2018 regulator the Office of Rail and Road said "no-one took charge" during timetable chaos that caused severe disruption on Britain's railways in May of that year. It blamed a lack of "responsibility and accountability" and said passengers were "badly treated". Cancellations and delays continue to plague thousands of commuters. For example, on Friday morning all of the trains coming into and going out of Waterloo, a major London transport hub, were cancelled after over-running engineering work. Industry body the Rail Delivery Group (RDG) said the punctuality information will help train operators pinpoint the causes of delays and improve their services. It won't lead to more compensation for passengers because companies will continue to be held to the standards set down in their franchise agreements, which don't take account of the new measures. However, passenger group Transport Focus welcomed the move towards greater transparency. Anthony Smith, its chief executive, said: "Train timetables need to be a work of fact, not fiction. "It is good to see train operators reporting true on-time performance to the minute at every station." Train firms will publish a spread of information about their services, such as how many were early, within a minute of the timetable or within three, five, 10 or 15 minutes. RDG chief executive Paul Plummer said: "Every second matters to us and our customers which is why rail companies have together developed and are now using these to-the-minute measures for train punctuality at every station as part of our plan to improve the railway today. "Record investment to upgrade the railway, including the roll out of thousands of new carriages, will continue to help improve journeys over the coming years and in the shorter term, we're using a more transparent measure of punctuality to help us cut delays and reduce disruption."